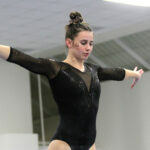 The Gustavus gymnastics team is set to compete at the WIAC/NCGA West Regional on Saturday, hosted by the University of Wisconsin-Stout. The meet begins at 2 p.m. in Menomonie, Wis. 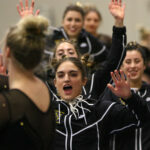 The Gustavus gymnastics team is set to host UW-La Crosse at 6:30 p.m. Friday in its final home meet of the season. The Gusties will honor their seven seniors on Senior Night - Sam Ardy (Thousand Oaks, Calif.), Victoria Aycock (Buffalo, Minn.), Jamie Erdely (Phoenix, Ariz.), Jessica Gerczynski (Kiowa, Colo.), Amanda Malo (Greenwood, Minn.), Katy Trunk (North Branch, Minn.), and Veronica Vasina (Arvada, Colo.).